Just like the previous Christmas and Halloween campaigns there was a section of the shop with furniture from older Valentine's campaigns, called Valentines Comeback. The campaign started with the release of the Swan Lake Bundle. 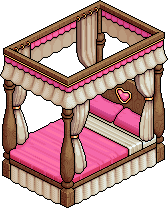 The Japanese Love Garden Bundle was also made available for the second time. This page was last edited on 22 April 2018, at 11:04.